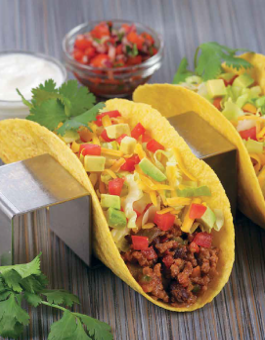 Tacos are a perennial favourite. Making them yourself increases the flavour and nutrition. I like to use corn tortillas, which you can find in most well-stocked supermarkets. Corn tortillas contain much less fat, less sodium and more fibre than flour tortillas. Definitely the winner! 1. In a skillet over medium heat, heat the oil. Add the onion and garlic and sauté for about 3 minutes, until softened. Add the red pepper, jalapeño, chili powder and cumin and sauté for another 3 minutes, until the pepper is softened and spices are fragrant. Add the beef and cook until no longer pink, about 3 minutes. Stir in the salsa and beans and cook until heated through. 3. To serve, place about ⅓ cup of the beef mixture in the middle of each tortilla. Top with the cheese, tomatoes, lettuce and avocado.